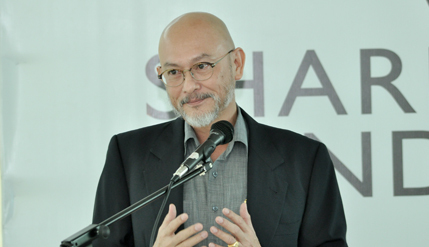 BANGI, 20 October 2014 – Integrity in the private sector must start from the top and those who are honest should be rewarded. An experienced corporate board member Dr Loh Leong Hua said the way that major contracts are awarded to companies in Malaysia must be made more transparent and open to deter graft. Speaking at the Graduate School of Business (GSB) of The National University of Malaysia’s (UKM) lecture series here today, Dr Loh, who is a UKM alumni, said corporate leaders should ‘walk the talk’ in their business dealings. In his lecture on Integrity: Raising the Bar in Organisations, he said company employees often take the cue from their observations of their bosses’ conduct. Dr Loh Leong is an Independent Non-Executive Director of WTK Holdings and is also a member of the of Sarawak Economic Development Corporation (SEDC) Board Risk Committee. He also sits on the Boards of Transnational Insurance Brokers (M) Sdn Bhd and YFG Berhad, a company listed on the main board of Bursa Malaysia. He said the way chief executive officers and managers lead their companies would affect the conduct of their employees. “Walk the tak. You don’t just say you want to have integrity. You have to do more than just talk and at the same time reward those who are honest,” he said. Being honest not only has strong moral principles in business but can also make a company more productive. He strongly advocated an open tender system, rather than direct negotiations, unless the transaction can jeopardise national security or reveal intellectual property. He cited examples of local and foreign companies that either were exemplary or dishonest in their financial transactions. He was concerned that in the domestic market there were individuals or companies that could not secure bank loans through normal means, but had to resort to other channels to get an even bigger lending facility from another bank. “Can’t get RM4 million, but can get RM 40 million. That was a case of direct bank lending involving a public listed company just before the 1997-1998 Asian financial crisis,” he said. A company in dire financial straits with declining share value can reverse the trend if it received a huge loan giving the example of a company which secured loans of up to RM200 million following which its shares went up from RM1 to RM28, he said. He praised Petronas as a fine example of a company with exemplary corporate governance and integrity, saying that it even went as far as not accepting or giving gifts during festive seasons. Dr Loh holds a PhD in Management Studies from UKM, focusing on corporate board practices. He is also an Advanced Management Program (AMP) graduate from The Wharton School of Business, University of Pennsylvania, USA. He has accumulated more than 30 years of experience in the financial services industry after having worked for several banking groups in various senior managerial capacities involving commercial, corporate, merchant and investment banking. Also present at the lecture was GSB’s Associate Prof Noor Azzudin Yakob who gave the introduction about Dr Loh.